Utility radios were made by over 40 different manufacturers, under a government directive. They were very basic to keep the cost as low as possible, enabling everybody to be kept informed of events. Both Mains and battery versions are shown. The battery version on the left was made by, Philips Lamps Ltd. and has a manufacturer�s mark of U8. The mains version on the right was made by, Kolster Brandes, and has the manufacturers mark U32. Both sets are single band only (MW) they are a Superhet using four valves, these are:-BVA276 - BVA243 - BVA267 and BVA211. 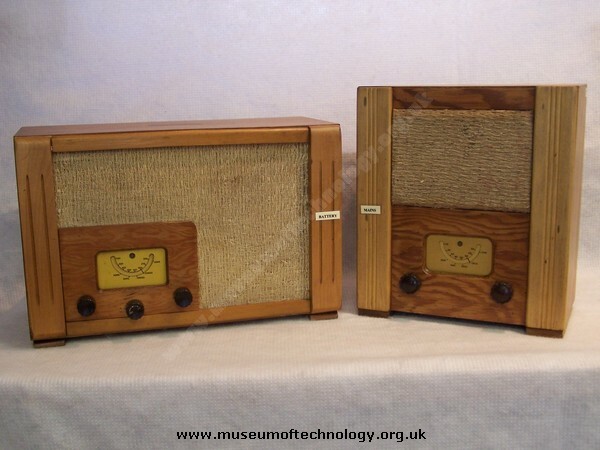 These sets are purported to be designed by G.D.Reynolds of Murphy Radio. There was also an 'official' LW conversion kit available after the war. This used a replacement BLACK dial and pointer disc with YELLOW lettering for both wavebands, a new coil pack, and a third knob added below the dial for waveband switching. Although these were pretty basic sets, they were quite expensive, but were all that could be bought during the latter part of the war years. I had, eventually, 2 of the battery powered types. I have photos and understood it to be a 3 valve (with top caps) superhet as it had IF transformers. The HT battery was 120V with a 2V accumulator for the valve filaments. It was known to me as a "Wartime Civilian Receiver" upon which I could get Radio Luxembourg in W. London! I have never found a circuit - anyone? The more common mains version was a medium wave only, very utilitarian design. No dial glass or illumination, and the toggle on/off switch was on the back at the bottom. A basic three-valve plus rectifier circuit was used but they worked quite well with a decent long-wire aerial. An unusual point was the use of a "Westector" as the demodulator diode. Several articles were published after the war, in popular wireless magazines, for a conversion to add long wave reception. This was quite simple: the volume control was replaced by one including the mains switch, and the toggle at the rear re-used for wavechange. The simple painted tuning dial with wire pointer could very easily have basic long wave stations added (no glass, after all). They were built by many different firms, which can (theoretically!) all be identified by the type number, and there are many small differences between them all.